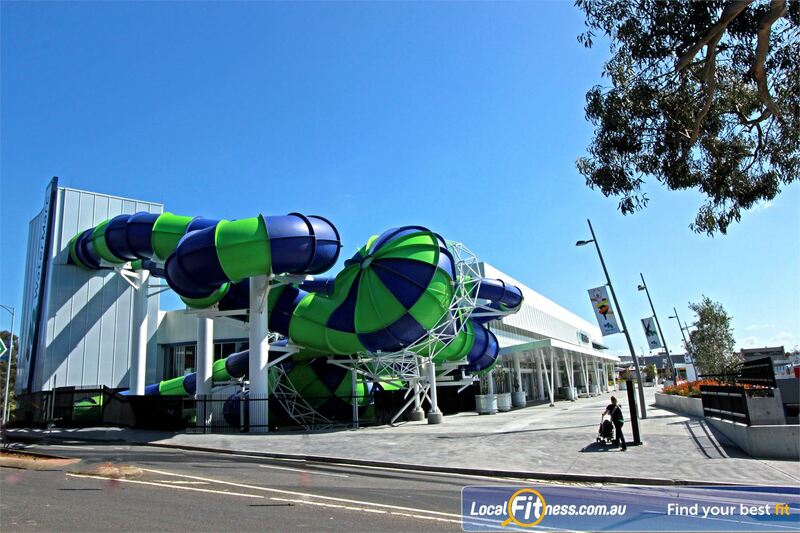 Why WaterMarc Aquatic & Leisure Centre Greensborough? WaterMarc is the name of our new Multi Activity Regional Centre. Together with the Greensborough Walk and Town square the new precinct forms a fantastic new community space dedicated to the community. This $42 million Banyule City Council project is a leader in the provision of health and leisure services with facilities that will continue to deliver excellent results for everyone - from the first time casual swimmer to the most dedicated of exercisers. - The Tantrum Alley waterslide – the only one in the whole of Australia! There is something for everyone at WaterMarc, a premier Greensborough gym and we'll ensure you’ll want to return again and again, on your own, with friends, family or work colleagues – to a place that welcomes our regional community with wide open arms. Come visit us and take advantage of our Foundation memberships today! WaterMarc is the name of our new Multi Activity Regional Centre in the epicentre of Greensborough. The largest aquatic and leisure facility in the northern region of Victoria, the $50 million Banyule City Council project includes the Greensborough Walk and Town square forming fantastic new community spaces and a community hub for the precinct. Headlined by the premier 850 sq/m Greensborough gym and the 50 metre competition Greensborough swimming pool, the WaterMarc facility also includes group fitness classes, personal training, the Greensborough swim school, Warm Water Therapy Pool, Aquatic adrenaline rides + interactive water play and so much more. There is something for everyone at WaterMarc Greensborough. Welcome to the state of the art Greensborough gym. More than 120 pieces of state of the art equipment. Our Greensborough gym features the revolutionary Technogym Wellness System. Benches, bars, dumbbells, barbells and more. The 850 sq/m Greensborough gym inc. treadmills, cycle bikes, cross-trainers and more. Greensborough gym instructors can tailor a cardio program to suit you. Our cardio area features calming views overlooking the pool. The latest cardio with personal screens, web access, usb and more. State of the art Technogym Kinesis One. The functional Matrix unit at WaterMarc. Our Greensborough gym inc. a fully equipped free-weights area. Dedicated Greensborough spin cycle studio. Dedicated wellness studio inc. Greensborough Yoga and Pilates. Popular classes inc. Les Mills and Greensborough Zumba. Our stretching zone provides relaxing area to unwind. Convenient indoor seating so you can relax in Greensborough's newest community hub. Delicious range of fresh and pre-made food made daily at the Daily Kitchen. Fully qualified, experienced and professional staff will keep your children happy. The entrance to the $50 million community facility. Specifically catering for beginner and intermediate swimmers, this dedicated pool allows for Greensborough swim school tuition of all ages and abilities. Swimmers can enjoy separate change facilities and large groups are advantaged by separate entry facilities. Learning to swim in Greensborough is bound to be a great experience. When fun filled water based activities meet a multi activity regional centre you have WaterMarc. The biggest, brightest and best all purpose regional centre around. Our aquatic facilities include a 50m Olympic size indoor Greensborough swimming pool with moveable boom that can create 16 x 25 metre lanes, a dedicated learn to swim pool, relaxation area with hydrotherapy pool, sauna, spa and steam room, fun filled activity water spaces and the most exciting aspect in the entire complex - the Tantrum Alley waterslide – the only one in the whole of Australia! With its Pipeline partner we just know you’ll be counting down to enjoy this thrilling ride – extreme fun for everyone, whether you’re 6 or 60. WaterMarc offers something for everyone, and ensures you’ll want to return again and again, on your own, with friends, family or work colleagues. Welcome to Water Aquatics at WaterMARC. The Indoor 50 metre Greensborough swimming pool. A moveable boom that can create 16 x 25 metre lanes. A hit with the community and community swimmers. A safe and fun place for your children to enjoy water play. The water playground SPLASH park at WaterMarc. Explore the many interactive features of the water playground. Water sprays, geysers and waterfalls. Here are the benefits of a WaterMARC membership. Our health club is the largest and best equipped in the area with superior, brand new equipment. Our staff are all fully qualified health professionals and will take personal care to ensure you can achieve the results you are after. With membership categories to suit all members of the community there will be a cost-effective membership for you. Complete an enquiry form and one of our staff members will be in touch to assist you to choose the right membership option. Do you provide health consultations? We sure do. All new members meet with one of our qualified instructors so we can determine your goals and recommend the correct training program for you. From there, there will always be a qualified fitness instructor on the floor to assist you with any question or tips you might need. All members will complete an aspiration map, which profiles each individual to determine the most suitable type of program. We will provide a personalised program and provide full training on the equipment in your first session with us. Will you offer personal training? Of course we will. Personal training is vital to the motivation and achievement of results for some people and we understand this. We will be offering Personal Training sessions from day one which will include 30 minute and 1 hour sessions and sessions for groups of 2 or more people. Personal Training can be a great introduction to your health and fitness program and can help you find the ideal routine to achieve long term results. How do I start up? Very easy, just download a pass on this page and come in to experience the brand new WaterMARC!